Developer: Edge of Reality (originally BioWare). 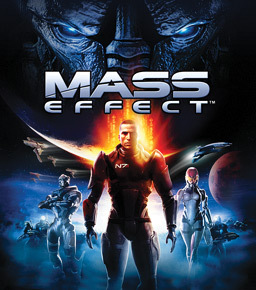 First thing’s first, credit must go to EA and Edge of Reality for getting the original Mass Effect out on PS3. For PlayStation owners eager to delve into the series, its belated and somewhat improbable emergence on the system in late 2012 ensured a complete trilogy, and the opportunity to see what we had been missing out since it first landed on the Xbox 360 to much fanfare in 2007. It’s a fascinating glimpse of one of the seventh generation’s early success stories, and one that highlights the encouraging, burgeoning maturity of video game storytelling. If you’ve played the second and third instalments already however, it’s perhaps best to check your expectations a little. Five years on from its original release and despite signs of age creeping into the game mechanics, it’s still an adventure worth investing in, though this surprisingly flawed PS3 port is far from definitive. Not so much open-world as open-galaxy, Mass Effect is essentially a third-person shoot ‘em up with heavy role-playing elements, as you shape a character (known as Commander Shepard) in your own image. With the human race trying to make their mark amongst alien races on The Citadel (the galaxy’s hub of power), Shepard’s initial goal is to track down Saren; a dangerous Turian agent suspected of going rogue. More pressingly, he’s been quietly amassing his own army, with the ultimate goal of bringing about the resurrection of a malevolent super-being known as Sovereign. And this means it’s your quest, along with a motley crew of intergalactic teammates, to go galaxy-hopping in the hope of picking up his trail. 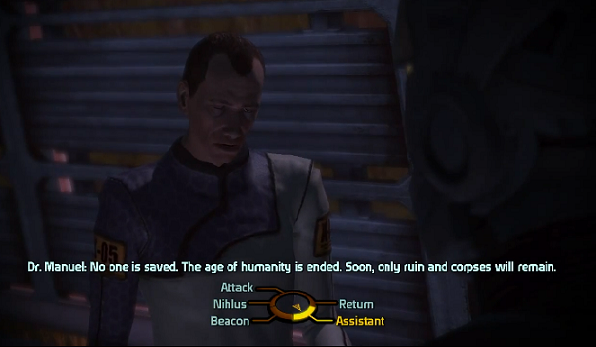 In 2007, Mass Effect offered a step forward in video game storytelling, and its narrative holds up well years down the road. A clever, well-conceived sci-fi soap-opera, ME offers all the depth you could want, though never at the expensive of the layman’s understanding. Whilst it touches on many interesting, imaginative ideas, it never drowns the player in techno-babble. The various alien races, evocative environments and political intrigues are supremely pitched, making Mass Effect an inevitable hit amongst Star Trek and Star Wars fraternities. The voicing, which includes stints from Marina Sirtis and Lance Henriksen, is top-notch and consistent across the board, whilst the fittingly grand (if a little in-and-out) music lends Mass Effect considerable cinematic gravitas. 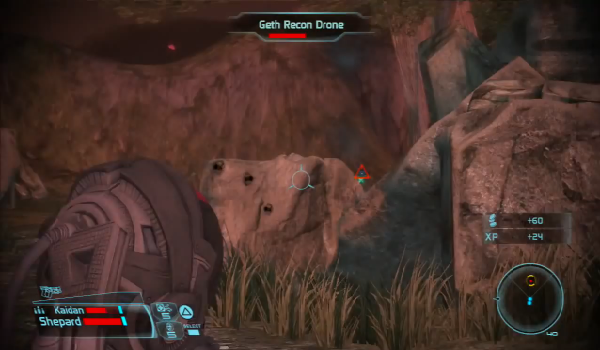 Upgrades are more conventional of an RPG, and work well within Mass Effect’s universe. Level-ups grant gradual performance increases, measured so you find your footing in the game as Shepard (and your squad) does. The ability to enhance Charm or Intimidation statistics is neat as it opens up new avenues within dialogues, and there’s a myriad of upgrades for armour, shielding, health regeneration and explosive characteristics, making for pleasingly discernable character growth. A glut of armours, weapons, special attributes and bullets are a little heavy-going at first, but allow you to build an armoury that’s adjustable for all manner of scenarios. The moral system is a touch disappointing however, coming off a distinct second-best next to the Fallout games. Initially, the idea of choosing between replies (or at least, their general tone) seems appetising, but it’s a selection that flatters to deceive upon a second playthrough. The game is caught between wanting to offer moral freedom and choice, and having to balance it with a strictly linear narrative, where outcomes to heated situations usually resolve themselves in the same manner despite markedly divergent behavioural options. So barring a couple of isolated incidents involving you squad members, the influence you assert over certain key cinematics is generally limited to whether Shepard comes across as heroic or petulant. There’s nowhere near enough of a difference between being good or being bad; you may be marked as a ‘Renegade’, but NPCs never seem to notice, meaning the second playthrough comes to feel a bit subdued. A common issue with early seventh-gen shooters, Mass Effect doesn’t run entirely comfortably on a PS3. It’s mostly a culmination of small factors; combat is acceptable if clunky, with neither aiming nor covering feeling entirely intuitive thanks to slightly lethargic controls. Visually, it’s some way short of the clarity achieved in the 360 version, but remains attractive enough in large part due to the original’s super-ambitious vistas, with the sprawling, whitewashed Citadel complex one of its many architectural highlights. But in terms of raw performance and gameplay, discrepancies are harder to ignore. Loading times are lengthy, you’ll grow to hate elevators with a passion, and the action is constantly lagging. One boss fight during the mid-part of the game is rendered almost unplayable, thanks to the frame-rate collapsing almost to freezing-point, whilst ceaselessly poor ally A.I. wander across the player's line of fire, or wedge you into corners. Thus firefights can be a bit hit and miss; some are pretty cool, some a little tiresome. Combat adheres considerably more to stats than skill, with headshots going largely unrewarded, and enemies taking a good few hits before eventually going down. Still, exploring a variety of worlds and solar systems is really cool, with the depth of the main story matched in absorbing secondary scenarios. There’s a mammoth array of extra missions to complete and pouring over the maps of the stars is rather wonderful. You can visit all number of terrestrial planets searching out artefacts, and even board Alliance ships that have been mysteriously left adrift in space. There’s a great sense of exploration in picking a planet and travelling there, though these missions are often marred by excessive cloning of interiors, as most showdowns and battles play out very similarly. Nevertheless, it's engrossing enough to keep you coming back until completion, which ranks at a healthy 25+ hours depending on how content you are with being side-tracked. Many years may have passed, but Mass Effect remains a grand endeavour. 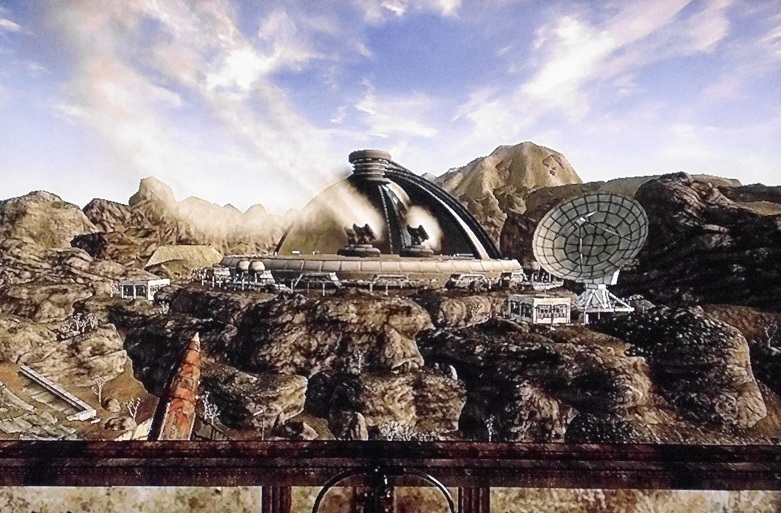 Whilst its combat is a little creaky in the wake of its sequels and the dialogue options don't match up to the more recent Fallout games, its story, presentation, character development and design all hold strong to this day. It’s not a great port; regressing both visually and technologically next to the 360 version, but with stronger instalments up the road and a reasonable asking point counting in its favour, PlayStation fans yet to sample Shepard’s arc could do worse than dip their toes with this one.